A Bridge is used when a missing tooth is to be replaced to enhance esthetics and function. 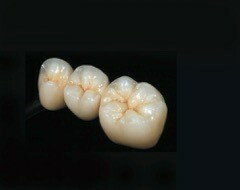 The bridge is similar to a crown but uses two or more prepared teeth to replace a missing tooth or teeth. When other options are not possible or desired this method can be used to replace a missing tooth. To get a proper consultation visit us today in Kansas City.